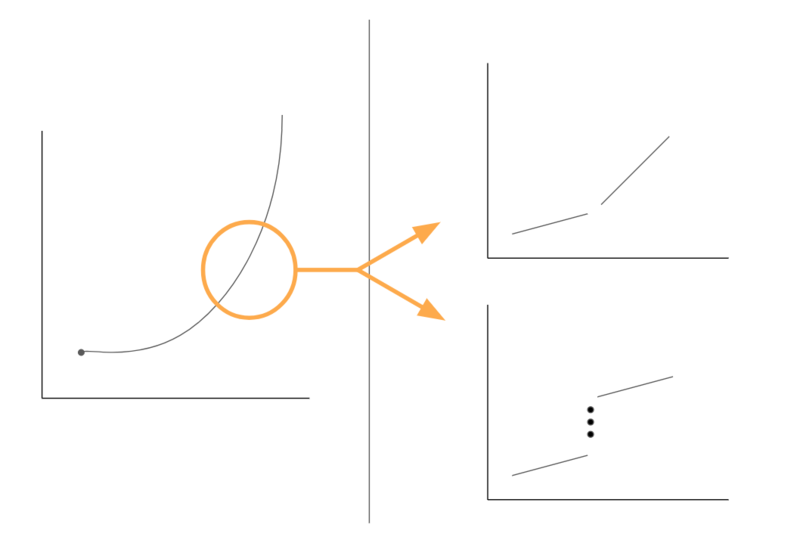 We’ve all seen the growth curve on the left – all successful startups strive for a version of one. But in reality, the notion of a smooth growth curve actually masks how most successful companies truly grow. Our experience at Foundry suggests that if you blow up the growth curve you’ll find that companies grow linearly and that what creates the log curve is a series of small changes that either change the slope of the growth (it’s still linear, but now growing faster) or that “jump” the growth curve up (growing at the same rate but now from a high base). Examples of things that fit in the first category are changes in sales efficiency, successfully adding to the sales organization, establishing channel relationships that add predictable revenue, etc. Typically these are small and change the slope of growth only a bit at a time. But over time they add up. Examples in the 2nd category are generally either changes in product that increase pricing across the board or landing an outlier large customer. These tend to be bigger, more obvious, and less frequent. Over the years we’ve found it helpful to think about growth in these categories – often asking out loud: “does this change the slope of our growth trajectory or jump the line?” so we’re on the same page about what the intended effect of an initiative is. It’s also helpful to step back from a several year growth plan to actually consider the levers that change the slope of the line. There’s no doubt that growing a startup is hard work. Sometimes it’s helpful to take a step back to really understand how small moves add up to the magic growth curve we’re all chasing.